Welcome to Hilladventures, based in the Highlands of Scotland. We offer climbing, navigation coaching and guiding throughout the summer or winter. Mark and Simon sent me an email of what they got up to this week so I popped it up on the Blog. On Wednesday we headed out from Glen Feshie up onto Carn Ban Mor and then over to Sgor Gaoith. It was all pretty scoured on the tops, but dropping down onto the more and towards Loch nan Stuirteag the thaw was evident. This made for pretty unpleasant walking. The plan was to head up Cairn Toul and drop down to Corrour Bothy, but the late start and slow walking through poor snow pushed us down into Glen Geusachan, and around Devils Point arriving at the Bothy at about 1830. The next morning we headed straight up onto Ben Macdui. A bit of a slog, but as we got higher the snow conditions drastically improved. The freezing level obviously dropping had done it a lot of good. Bomber hard snow all round. It was pretty wild on the tops, but as the day went on the visibility came good as we headed into Corrie Domhain to snow hole for the night. Once dug, we headed out for a few hours of night nav around the area. An early start this morning, with a glorious sun rise and amazing views to take us down to the car park. A nice bit of light hearted suffering in preparation for WML. Nice to be North of the border again and to catch up with you. We went for a wade up to Cam Chreag on Meal nan Tarmachan on Saturday, to find a very heavily snowed up crag that seemed to be less frozen than we were (see first photo). Sunday brought better weather and conditions on Lurchers crag, with some patches of well frozen turf on the crag and a fairly light cover of fresh snow on top. Unfortunately Friday's thaw only seemed to have gone up to about 800m in the Cairngorms so the snow in the gullies was useless and we didn't fancy floundering around in it, so did a nice route up one of the ribs. Nice sunset and great day to be out in the hills. On Monday we headed in to Sneachda, which was ok to start off with but we didn't brave the slope up to the Message due to a serious weak layer about 20cm down into the snowpack. We got on Honeypot instead, which was good to start off with and had some ice and neve on the edges of the rocks but useless powder over the ledges. Conditions quickly deteriorated, so unfortunately I had to back off the top pitch just below the crux as everything was getting blasted with spindrift. This started building up some really weak slab, which I triggered a small soft slab avalanche on the exit slopes whilst blinded by spindrift. It was a day to be pleased with just getting a route done safely! It all needs a decent thaw and reasonable freeze to be honest. Skiing looked good though! Working with the weather this week we have spent some time at the coastal venues in North Wales. After spending Tuesday dodging showers we managed to bag 4 or 5 classics at Pen Trwyn. 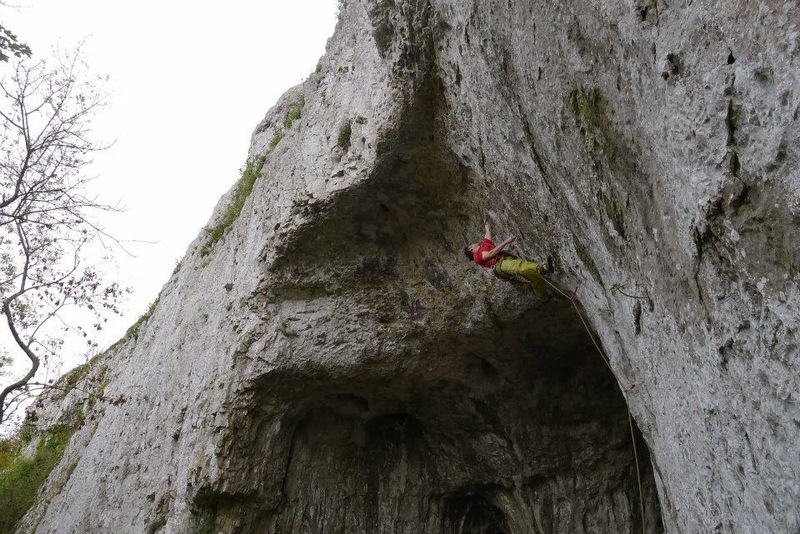 On Wednesday we decided to go to the usually dry all weather venue of Llanddulas only to find a stream of water running down the Forgotten Sun Area, but up at the Upper Cave area the routes were in a semi dry state and the sport began. 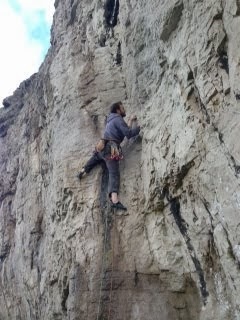 With ascents of Mind Light F6a+, Spider Mite F6b, Llanddulas Ditchwater F6c and Owen making the moves on The Wirral Whip. We headed for the Slate in the afternoon to the reliable Dry Bus Stop with a quick stop at the Caban cafe for lunch. With dry weather on Thursday we headed to Gogarth which was dripping wet in places, so we split into 2 teams. James and Simon headed to Yellow walls and Smurf Zawn for some adventure on "The Savage" E2 5b,5b and some inadvertent new routing. 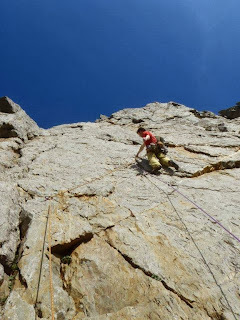 Whilst Owen and I headed to great Quartzite walls of Holyhead Mountain. Climbing "Brothers" HVS 5a and Owen missing out on the Flash of "Snake Bite wall " E4/5 6a. Out on the east side of Drumochter today with Anna, Jess and Luke. Again today, the wind was a big factor averaging around 35mph just to make it interesting, giving every one a warm glow at the end of the day. The snow pack was well bonded, but with sections of wind slab. With a bit more snow lower down it would have made for great ski touring up on the plateau. We started in the lay-by just below Drumochter lodge, on the south side carriageway, and then made our way up to Doire Dhonaich. Next on to Meall a Chaorainn via some small features and then through some amazing sastrugi (sharp groves formed by wind erosion) on the way to A'Bhuidheanach Bheag. A few more bearings and a lot of pacing and we found ourselves heading back down a ridge to the Beauly-Denny powerline construction road. Stonking conditions on Great End on saturday. Great neve which was great for picks and monos! All the easy routes (except SE gully which was not in) had good snow cover and some great ice, although it was very brittle and dinner platey in places. Central left hand branch looked a little thin but good, we did middle variation which was good with great neve and a nice little ice pitch near the bottom. Descended Cust's gully which was great neve all the way and has a line of steps. Went up Window gully which is as fat as I have ever seen it, although Wall and Groove finish is still a bit too thin so we finished up Icefall finish (III,4 at the moment). Then descended Branch gully, which has a nice interesting step at the chockstone at the moment. Had a quick solo up 1 pitch gully, which had good ice but was certainly harder than grade II! weather conditions from where we have been. Hill Adventures. Simple theme. Powered by Blogger.